We get a lot of great feedback from our lovely guests but the one comment we get again and again is that we have "the best park amenities"! They are modern, clean and well maintained. And apparently the best some of our guests have ever come across! We've also got some other great facilities in the park that deserve a mention too so read on to find out about our landry, camp cooking options and huge playground! It's a small detail but guests seem to love our amenities block. It's probably the thing that we get the most positive comments about. 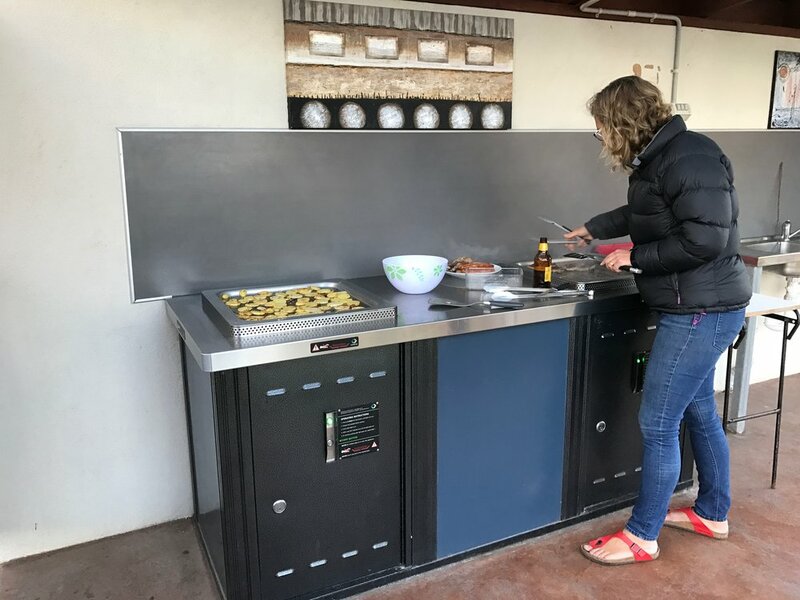 We've done a lot of camping around Tasmania and we have to agree - it's the best amenities block we've seen in a caravan park ourselves. It's clean, modern and the shower stalls are private so you can enjoy a hot shower in peace. Playgrounds are always a major win for families when camping. Little ones can run off some of their excess energy while parents and friends relax and have some time to themselves/ We have two playgrounds. This big whopper which can entertain for hours and a smaller toddler playground near our camp kitchen. Our laundry isn't just a messy space. For those that want to get away and relax and read there's space for you to hang out. 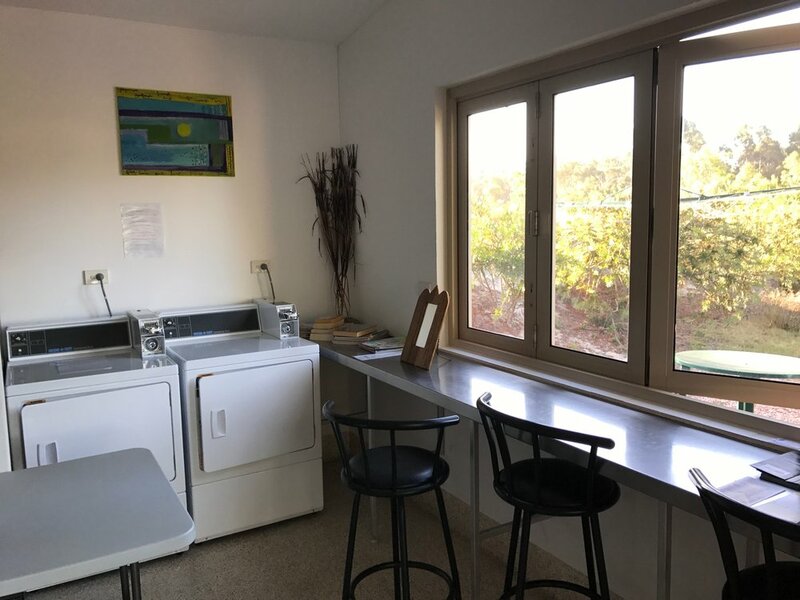 We have large commercial washers and dryers and a couple of traditional Australian hills hoists for you to hang up your laundry on a fine day. We've got a range of options for cooking while you camp or stay with us. Our camp kitchen is indoors and there's plenty of space to BYO table and chairs if you want a change of scenery. We also have an undercover BBQ area near the safari cabins and a fire pit for those who want to get back to camp cooking basics. We pride ourselves on the friendly community atmosphere that our park has and we continue to try to improve the park. So if you've stayed and you think we could make something better - please let us know by contacting us! This post is care of the Scamander Sanctuary Holiday Park on the stunning East Coast of Tasmania. A caravan park and camping ground in Scamander, Scamander Sanctuary Holiday Park offers family friendly camping and in a beautiful natural setting right next to the beach and a nature reserve. Scamander is the perfect location to explore the Bay of Fires, St Helens and Bicheno. Camp or park your caravan or campervan at an unpowered or powered campsite or book a safari style self contained cabin if you prefer to camp in style with all the conveniences of home. Find out more or call us on (03) 6372 5311 to book.